Meet Publius Feena Momanyi, in person polite and softly spoken but delve beneath the surface, a man deeply passionate about improving the status of youth employment in Kenya through organic agriculture and with a long history of inspirational work with young people. We’ve been working with him in Langas and Racecourse, neighbourhoods just outside of Eldoret, to launch his agricultural consultancy and feed supplier start-up SWOP: named so because knowledge exchange is at the centre of the business. Big farming is a thriving industry within Eldoret and the Uasin Gishu county, and with so many staking their livelihoods on crops and livestock, possessing the right knowledge to rear animals and the latest cultivation techniques becomes key. 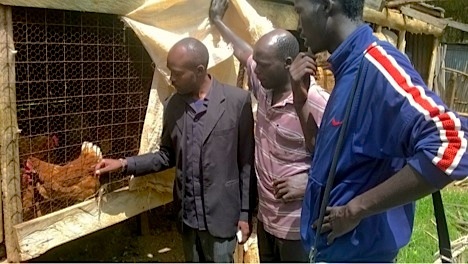 Through the Balloon Ventures programme we’ve been liaising with farmers and local people rearing livestock to raise awareness about common mistakes such as using the wrong feed or overcrowding the animals and establishing a strong demand and need for these services. It became clear how many people and farmers were using trial and error to great personal expense and how important Publius’ services were for the success of local livestock businesses. In addition to establishing SWOP, social enterprise is very important to Publius, so we will be working with him to organise events in partnership with high schools and universities to encourage young people to launch their own agricultural ventures and educate them on the potential pitfalls. Below is a conversation we had with Publius about his business and experience with Balloon. What were you doing before Balloon? Working for the Christian Foundation for Children and Ageing as a social worker, I was talking to mothers about economics, self sufficiency, and sustainability. I recruited 800 students for sponsorship in the Langas slum area conducting home visits and providing counselling on issues such as family disintegration, separation and domestic violence. I was also involved in training them on financial accountability, producing documents, going through bank slips, calculations for loans and monitoring their finances. This skill-set has proved useful in starting my own business. Before Balloon I was also involved in the New Life programme which worked with street mothers to help them rear pigs instead of scavenging in the garbage pits. How did you hear about Balloon? In Nakuru I was training widows and orphans and had heard from my friend that Balloon Ventures had benefitted him so I enquired about the organisation. It has helped me come to realise that you can be your own boss and employ people – I feel empowered by that. SWOP: the agricultural consultancy and feed supplier. I want to start with feeds as an entry point and bring about organic farming, the natural way of agriculture – the best practice so far. I chose this business because it doesn’t have much penetration at the moment so there is the opportunity for growth monetarily and socially. I am also passionate about young people and want to encourage communities – employment is the issue here in Kenya for young people and this is a tool to encourage the youth to take up jobs. I want to run conventions on permaculture at Eldoret’s universities and secondary schools to open young people’s minds to the career choices in agriculture and the methods such as polyculture, aquaculture and apiculture – the organic methods. Moreover, I also believe my business idea will help tackle the issue of food security, which is a global concern. Balloon has really helped me with the business training, giving me ideas on how best to launch my business as well as the need for repeated testing. I have also gained a better understanding of how to go about planning the business for the future. Recently my team has taught me the importance of marketing, of using social media to create brand and community awareness. That the business will grow and expand, that it will be able to employ a good number of youths and that it will be international. I want to inspire youth. Written by Sammy Brook, ICSe Volunteer 2015.